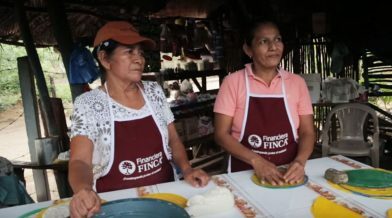 FINCA helps Nicaraguans living in poverty access financial services to improve the quality of life for themselves and their families. When she started her business in her home, Julia was able to produce 200 tortillas daily. Today, with the help of FINCA loans, she has moved her business outside of her home and is able to sell every piece of the 800 tortillas she makes daily. Today Nicaragua has a stable and growing economy. Yet, it is still one the poorest and least developed countries in Central America. Poverty is concentrated in rural areas, where access to basic services is often nonexistent. With limited employment opportunities and inadequate infrastructure, incomes of the poor in Nicaragua remain at low levels. Women in rural areas, in particular, are among the most disadvantaged in Nicaragua. Despite close to a fifth of rural households being run by women, a small percentage hold titles to the land they work. In addition, most farm-based households cannot survive on farming income alone and depend on at least one family member who works off of the farm. When poor people have access to financial services, they can earn more, build their assets, create jobs, and cushion themselves against external shocks. Since 1992, FINCA International has been helping thousands of Nicaraguans improve their lives. FINCA offers financial services, such as loans throughout the country.